IT WAS STRANGE to walk out of a cafe where people sat at tables with plates full of food and into an evening seminar on food insecurity and urban agriculture. I couldn’t help but think that not far away on the other side of Sydney University, where the seminar was to take place, there were people probably experiencing food insecurity this same evening. Over there, beyond the gates of the university, there were also others practicing the urban agriculture that was the theme of the seminar. They inhabited the community gardens dotted through this local government area as well as Pocket City Farm, a small, commercial, inner urban market garden within walking distance of the university. Megan Battaglia, Masters of Sustainability student at the University of Sydney. Next day, the seminar was followed by a session, more a conversation, between Sydney University’s Alana Mann who works in communications and food issues, Lenore and Toby. That attracted people from the Australian City Farms & Community Gardens Network; Tarrania Suhood who has her own small business, InCollaboration, and works with the New Economy Network Australia; a couple PhD students including one from the University of Hawaii — both are researching urban agriculture; one from Randwick City Council sustainability unit; urban planner and urban agriculture expert, Ian Sinclair and others. The informality of this session allowed us to explore areas not covered in the seminar. Much was learned. Ian explained that the Penrith Food Policy was an early local government initiative to come to terms with food security in Western Sydney. I supported this by telling the meeting about the South Sydney Council Food Policy, perhaps the first local government policy on food security in Australia when it was released in the mid-1990s. Alana Moore explained her involvement with the university and City of Sydney in looking at linking food enterprises with citizens via digital technologies and of a food systems incubator in the city. Connectivity is a key, she said. With around eight percent of people living in the City of Sydney local government area experiencing food insecurity, which includes consistently missing meals because the cupboard is bare, there are significant barriers to establishing new food initiatives and dealing effectively with it. the high costs of rents and household utilities that limit the amount left to spend on food. the failure of a local farmers market to provide affordable food because of its high prices; one commentator put this down to the gentrification of inner urban areas; it goes against something the convener of the farmers’ market association said to me at the Blacktown Council food security workshop some years ago — Securing Our Food Future — that farmers’ markets should be places where basic foods are obtainable. I would now add: at an affordable price. 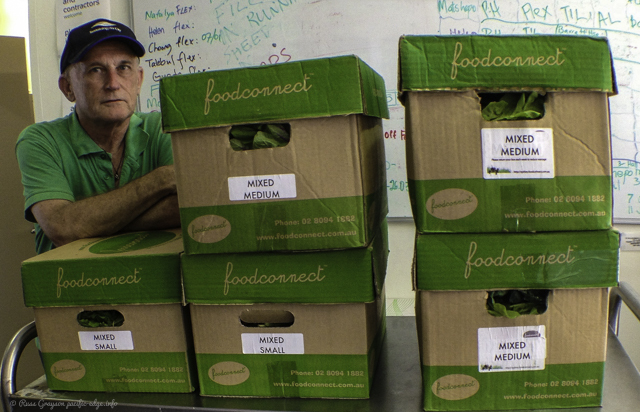 Sydney Food Connect was a hybrid community supported agriculture (CSA) scheme that aggregated produce from regional farmers and distributed it to urban subscribers. The CSA was bought by Ooooby which operates a similar scheme. Alana Mann advocates connecting food, its accessibility and affordability to local economies and urban planning. One of the commentators then raised that often-asked question that comes up when local food is discussed: how local is local? I suggested it was up to four to five hours truck journey from the city. This includes the urban fringe market gardens, orchards and poultry farms, the ‘periurban agriculture’ as it is known to academics and food system advocates. Access to the food produced in different microclimates means this distance offers a range of foods for a diversified diet. It is also the distance disclosed through the practicality of running urban, hybrid community supported agriculture schemes like Sydney and Brisbane Food Connect. Recognising that some might say the distance too great, I said I avoid the term ‘local food’ and use instead ‘regional food’ because this supply chain accesses different geographic and climatic regions. Greater diversity brings greater security of food supply. The loss of urban fringe farmland was expectedly raised. Ian Sinclair explained that the Sydney region produces five to six percent of Australia’s vegetables, much of which feeds the city. He said the value of food produced on Sydney’s urban fringe farms has recently risen although the land area occupied by them has declined. This links to the need to stop the spread of detached houses into farmland and the urbanisation of good quality productive land. Densifying population was a solution many agreed with, Ian saying that it was technically feasible but not socially feasible because some communities oppose taller apartment buildings and even apartment development altogether. A week later this was the subject of an article in the Australian Financial Review, Housing supply: NIMBYs preventing needed medium-density housing, Grattan says, reporting a finding of the Grattan Institute, which also proposes slashing immigrant numbers to take pressure off the strained housing market. Lenore, a fisherman’s daughter, described a unique land tenure system where she lives near Vancouver. This is the Agricultural Land Reserve system that when introduced met opposition because some people thought it would push down the value of their land. The Reserve system is reminiscent of a similar proposal around a decade ago by the Sydney Food Fairness Alliance, now amalgamated with the Right To Food Coalition. It is her model for suburbs in which agriculture plays an ongoing role, what she calls “Agriburbia”. The Vancouver scheme retains agricultural land for farming rather than urban development, which in Vancouver can be done only on brownfield sites. A result, Lenore said, is that urban sprawl is densifying. It might have been Ian Sinclair who said that a similar population densification is now being researched for Sydney’s old, middle ring suburbs like Bankstown. Lenore also explained that it has been socialist governments that took the initiative to preserve food-producing land, not the conservatives, yet conserving land for farming is an inherently conservative thing to do. The daytime session was more far participatory than the presentation format the Sydney Environment Institute usually has, because with a small group it was a many-to-many conversation rather than a one-to-many presentation. That’s not to denigrate the presentations, for they too are useful. At some of the Institute’s seminars, academics present research findings that they put across as new. Those in the audience who have worked in the field know that some of these things are not new, that there are precedents. A suggestion was that researchers look into trends and practices from the outside rather than participate in relevant networks where they would discover more, such as is done in anthropological immersion research. This was reinforced for me when I worked in local government supporting community agriculture and landcare. When a young woman from a Melbourne university, promoted as an urban agriculture expert by the consultant hired to do the report for a proposed city farm presented her findings, I had to add as many city farms again to the list she had compiled and make other changes. It was that looking in from the outside again and having no connection to relevant networks. The urban farming events were another contribution to the conversation around food security and urban agriculture by the Sydney Environment Institute. It was clear that there are no easy answers and that simple solutions won’t work because urban agriculture and food security are complex problems. Urban agriculture is bound up with land access, economics and politics. Essentially, it is less a question of farming or land access and more a continuity of social, environmental, distribution and economic questions for which the answer is political. It is clear that there can be no meaningful conversation around urban agriculture that ignores food security. They are closely connected as parts of a larger system. Lenore Newman’s participation was made possible by Melbourne-based food advocacy, Sustain: The Australian Food Network. On the food frontline: seminar highlights growing challenge of food insecurity. The Community Food Movement: Sydney Environment Institute’s seminar explores movement’s needs. Here’s a review of last year’s urban agriculture symposium organised by staff from the University of Sydney’s law faculty that attracted participants from western, eastern and southern Sydney and as far away as Melbourne. Food Summit hands declaration on food futures to NSW Parliament (2009). The declaration produced by the food summit in Sydney, organised by the Sydney Food Fairness Alliance. Declaration on Food: Plains To Plate (2010). The declaration drawn up at the Plains to Plate conference in Adelaide, South Australia. A busy city concourse is the last place I expected to stumble across a food garden. But that is what happened. So here’ s a picture story of the edible garden on Brisbane’s Southbank that I unexpectedly came across while wandering the banks of the muddy Brisbane River. In Sydney’s Eastern Suburbs, not all that far from Coogee Beach, there’s a local government sustainability education centre with the Permaculture Interpretive Garden. It is a prototype development on public open space set up to trial permaculture landuse design and community resilience education in a local government context.